It’s been six months since my face got kicked in with a scalpel. My surgeon told me that the results I experience after six months will most likely be the results I’ll live with for the rest of my life. I’ll begin with the good news, since I believe we should always focus on the positive (unlike, say, the news). My braces should be off by Christmas time. Apparently they’re only still on so I have a place to hook my elastics on to. That’s going to be a glorious day. I’ll be able to smile while I eat! Now for the less than optimal news. I’ve been left with a severe open bite on one side of my mouth. This makes it difficult to chew, especially when it comes to items like steak or gum. I’m considering having a second surgery performed to close my bite. It would be far less intense than the first one, since all the surgeon would have to do is make a single cut along the roof of my mouth and insert enough putty (read: cadaver bone) to fill in the gap that needs to be made to push my teeth together. I’m also still completely numb in the lower left corner of my bottom lip and chin. I believe this is permanent. It doesn’t actually bother me though, because the only time I notice it is when I’m shaving. That’s the end of the news. We’ll now go to intermission with a little video slideshow I threw together that cycles through all of my mugshots. I searched long and hard to find a fun tune that has the words “teeth” and “jaw” in it, and I succeeded! Don’t worry–it’s only 19 seconds long! That was a fun little intermission, wasn’t it? Thanks to everyone out there who has taken this trip with me! I’ve enjoyed the messages, emails, in-person encounters and comments that have all contributed to building a community around this odd experience. Hello, is it normal for your chin and gums to still be numb after 2 months Post Op? How long is the numbness going to take to go away and feel normal when chewing/eating food? I’ve really enjoyed looking at your blog. It’s helped me out in my preparation for my corrective double jaw surgery and also in my recovery. It is the start of my fifth week of recovery after my corrective double jaw surgery on June 7th, 2017. I am doing really well overall. I got tired of smoothies, so I mainly eat foods that I don’t have to chew (yogurt, eggs, soft pasta, etc). My lower left lip and chin and my upper right lip and cheek are still swollen. I don’t mind it overall, but as these areas are recovering and feeling is coming back to the nerves in those areas, it really itches :/. I was told by my oral surgeon that this feeling of “bugs crawling on your face” is completely normal. However, it makes it hard to sleep and at times hard to get things done when all I’m thinking about is my face itching. Do you have any suggestions on remedies to help out with the itching? I’m trying out essential oils (a homeopathic approach) and have been taking Tylenol PM to help me sleep. I’m 2 weeks out post-op from having a double jaw surgery. I can’t feel my chin or my bottom lip at all. I do feel burning sensations and slight tingles. I was wondering did you feel this on your lip and chin as well, or no? I just want some feeling back in my bottom lip and i’ve read so many forums and blogs and I just don’t know what’s possible or not. I’m slightly trying not to freak myself out either. But, I was hoping you might be able to shed some light or insights on whether or not you think I might any or some get feeling back? I’m 15 days post double jaw surgery, I also had 5mm off my chin. My feeling is coming back slowly, I’m just stressing over the swelling. I want it gone, I feel like a chipmunk! I’m four days away from my double jaw surgery and the run up to this has been pretty exhausting – my medical insurance denied my claim twice but my amazing surgeons fought my case, and we finally got the approvals for the surgeries (minus the genioplasty) last week!! The surgeons have warned me about the chance of my lower jaw splitting badly during surgery, but I have an increased risk as I still have a back molar hiding down in my gums and resting pretty close to the bone. Has anyone else had a similar warning? Apparently, if the jaw splits badly they will need to put a halt to the surgery and try again in 6 months. Gosh, I really hope and pray it doesn’t split. I just wanted to thank you Graham, and everyone else who posted in this blog.. I am 5,000 miles from home, and the thought of the surgery is terrifying, but the thought of not having my Mom around for the recovery is equally as scary. This blog has helped me immensely. Mary, it sounds like you’ve been properly informed of the major risks, so props to you for still having the strength to move forward with it. 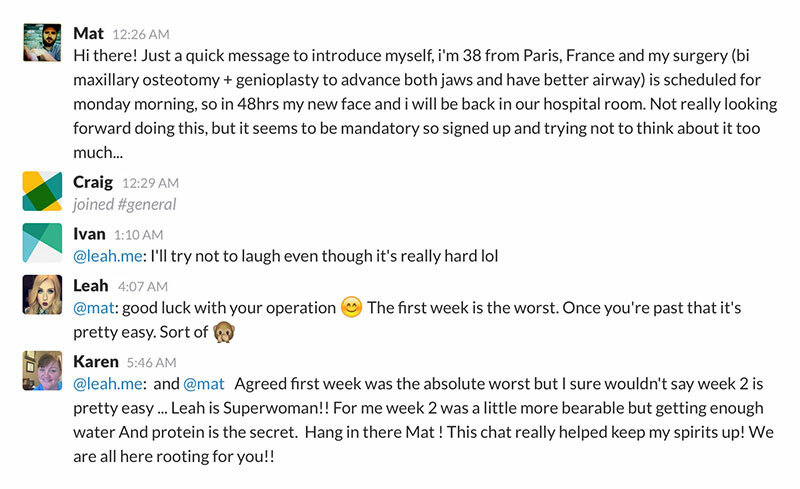 I encourage you to join the chat group (if you haven’t already) so that you’ll have understanding people to talk to when you return home from surgery next week. As for the risk of your jaw splitting, I’ve never actually heard of this, but it’s encouraging that your surgeon is honest with you. Has anyone else been informed of a risk with their jaw splitting? 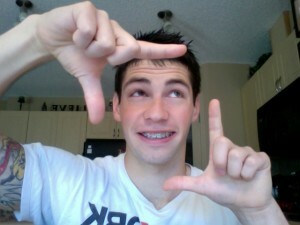 Hi I had My double jaw surgery yesterday… I wantbto Thanks you for THIS awesome blog. It helped me so much. I found this blog and have marathon read it like a new sitcom added to Netflix. This is awesome Graham! Makes me feel much more normal. I am also very blessed to not have an elastic fortress keeping my mouth shut! I’m on day 9, so I’m sure I’ll have more questions! So I’m a few days aways from the the 3 months mark! Can’t believe it went by so quick. This blog has helped me tremendously and I would just like to thank you for that. Just wanted to know, what happens after the 3 month mark? Does the swelling decrease? Is there still a chance of infection? I am 14 weeks after my double jaw surgery still have my braces on but my bottom lip is still numb, i started to get feeling back in my bottom lip before i found out i needed root treatment on a heavily filled tooth, do you think the feeling will come back? I can slightly feel it if i heavily bite my bottom lip but other then that i can feel the outside if i rub my finger across it, any idea if ill get it back? I am 11 days post surgery and my lip and chin is burning. It is driving me bonkers. How long does this last–a week, a month? I am going crazy. I was feeling pretty miserable about the shape of my nose after jaw surgery–it was so much wider, and tipped up and crooked and kind of an amorphous blob on my face. 7 months post op my surgeon put in sutures to help bring in my nostrils, but my nose looked exactly the same if not worse after that. Finally I went to a plastic surgeon and discovered that my septum had moved to the right and twisted up so badly that part of my cartilage had caved in. I’m now about 3 weeks out of rhinoplasty and crossing my fingers that a year from now I’ll be looking at MY face! But I will say it’s already better and I can breathe out of both nostrils now, when they’re not congested from the swelling. Do you know of anybody else who has needed rhinoplasty after jaw surgery? Yeah, all and all I am extremely happy with the outcome/results of this surgery. Like you, I am getting A LOT of positive support from people, often in the form of compliments. I came forward 17mm on my lower jaw and my upper jaw was raised and moved forward as well. Cosmetically, people now tell me I have higher cheekbones, more prominent eyes, etc. All good things 🙂 My surgeon is known as “the big guy with the magic hands,” and although his bedside manner is pretty awful, as are his communication skills, his surgical skills are downright amazing. I have had very few complications, so I think I am lucky, however post-surgery I was left with an open bite (like you). My orthodontic team has been working to close it and they are making progress through use of bands, etc. My lower jaw is still pretty stiff at this stage, and even at 5 months I am avoiding eating anything super hard. I know the bone is healed but I’m approaching chewing gradually. I’ve worked my way to hamburgers and pretty much everything except really tough meats, nuts, super-crusty breads, or ultra-hard veggies (broccoli). I’m still numb in parts of my face as well, but that is fading (slowly). Anyway, thanks again and have a great week!